Today marks the 50th anniversary of the March on Washington for Jobs & Freedom, and Martin Luther King Jr’s “I Have A Dream” speech. Rev. 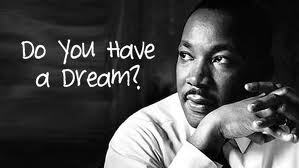 King had a dream of true equality for all people and believed some day that equality could become a reality. His speech he gave that day is oft quoted and has inspired generations. As I was reading some of the background of the march and speech it caught my attention that the original speech didn’t contain the most well-known section of the now famous address. It is said that singer Mahalia Jackson called out to him, “Tell them about the dream, Martin.” Whether it was her prompting or something within himself, Rev. King departed from his written text and began to speak from his heart…or preach from his soul about the dream of equality for all people. It is this passionate proclamation that helped further the civil rights movement and bring change to our country. Perhaps it’s a dream for yourself or your family. It may be a dream to see change come to the lives of those you love, or eliminate hunger and need in you community. Or perchance it’s a very personal dream to bring healing to your heart and life. Whatever your dream, it matters. It is so easy to become discouraged and believe that you are only one person. You aren’t famous and you don’t have a lot of influence. Neither did Martin Luther King, Jr when he led his first civil rights boycott. He was a man with a dream who wasn’t afraid to believe in it fully, giving his all (and eventually his life) to make a difference to those in need. He may have needed some encouragement from those around him to share his dream and allow others to grab hold of it as well. I am inspired by Rev. King and his obedience to his call. I imagine he had no idea he would become one of the great orators of American history or that he would make a difference in so many lives. He had a dream, put in his heart by God and did what he was called to do. He allowed God to take care of the rest. I pray today that you will be inspired by the faith and obedience of Rev. Martin Luther King, Jr. Allow God to develop the dream He has put in your heart and don’t be afraid to share it with others. You never know who needs to be inspired by you today.